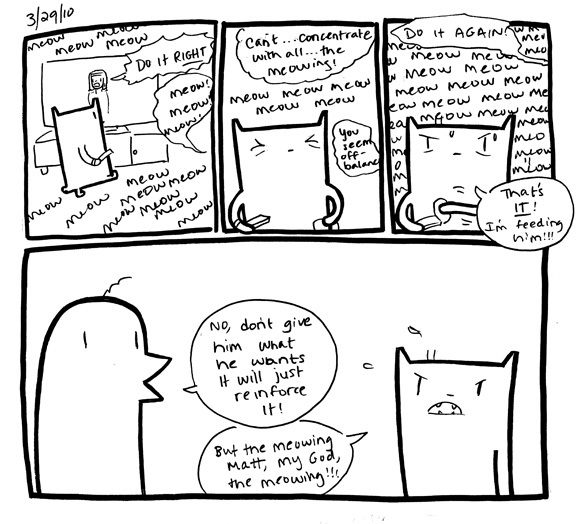 Squarecat Comics » Archive » MEOW!!! Ugh, this is like my cat in the morning. She starts meowing at my bedroom door. I want her to stop meowing but I don’t want to feed her and let her think she can get her way by doing that. It’s a vicious cycle. Oh man, Jenn, that sounds familiar too. Don’t give in! Stay strong! Hahaha, yeah, frikkin’ cats indeed. They are jerks. Ah, cat douche. Poppylove, yeah, I think so. I think I’m really easily lead on too. I want so much to believe that I can have all the fluffs without the guffs. But I can’t. I never can. I fall for it over and over and over! Let’s not analyze this. Haha.